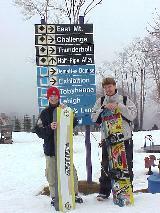 We will help you decide where to snowboard and ski in the Pocono Mountains this year. First the big news: Camelback has been selected by PoconosBest.com as: "Ski, Snowboard and Tubing Resort of the Year"
Click here to find out more about the awards - Here is the Guide to All Pocono Ski Resorts ! Book Your Ski Vacation Lodging (including Ski and Stay Packages) Online Here!